"The breadth of contributions and the variety of approaches make Transitional Justice Theories a thought-provoking book and an important resource for those interested in the theoretical aspect of transitional justice"
"This volume covers an impressive breadth of conceptual discussion of transitional justice." "Overall, Transitional Justice Theories is packed with consistently informative, engaging, and thought-provoking essays that are sure to grab the attention of anyone interested in justice on an international scale. The fact that the volume approaches transitional justice theory and its problems from a multi-disciplinary standpoint ensures a greater potential for the proliferation of discourse within this area that is able to respond to the issues raised by the authors. 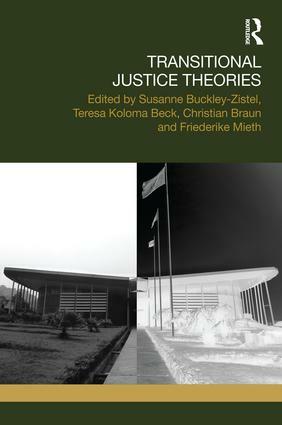 The book's authors refrain from attempts at drawing conclusions to theoretical transitional justice, and instead issues are often left open to the interpolation of alternative or less congenial ways of thinking about the dominance of Western legal discourse within the transitional justice framework, offering the opportunity for further scholarly discussion and development."